Sie haben Probleme mit Ihrem WLAN? Ständig Verbindungsabbrüche? Die Geschwindigkeit lässt zu wünschen übrig? Überprüfen Sie doch die Auslastung der WLAN-Kanäle mit einem Spectrum Analyzer ... vlt. ist genau der von Ihnen verwendete Funkkanal überlastet? Oder stört die Mikrowelle, das Babyphone, das DECT-Telefon, die Bluetooth-Geräte? All diese Geräte funken im selben Frequenzband wie Wireless LAN und können somit die Verbindung stören. Mit einem Spectrum Alanyzer spüren Sie die Fehlerquellen leicht auf. The AirView Spectrum Analyzer is useful in studying all RF energy contributors in the 2.4GHz band, but has particularly useful tools that make it ideal for optimizing 2.4GHz WiFi Networks. 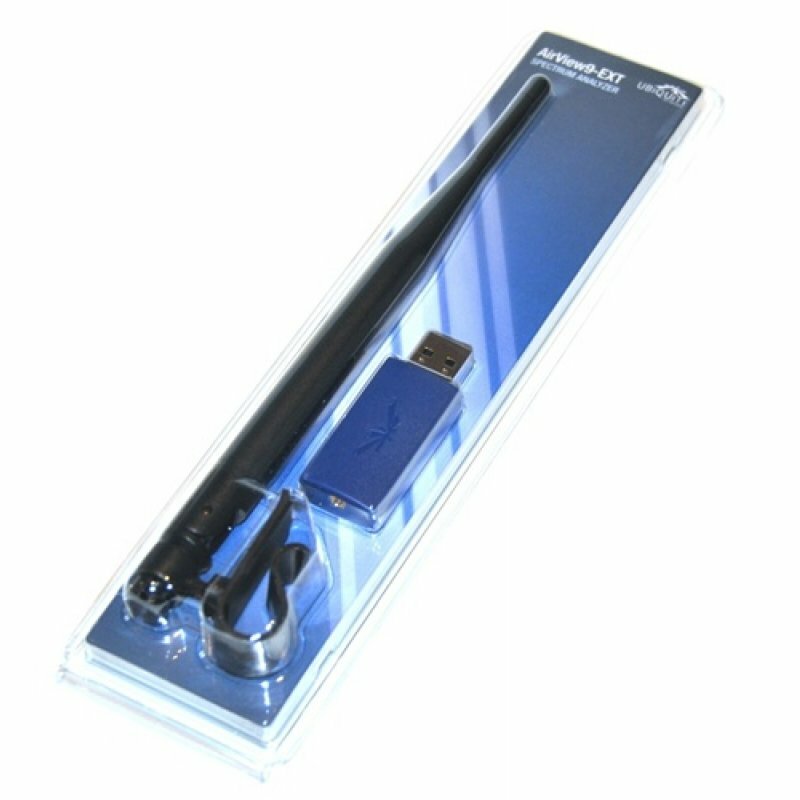 AirView is available in four different models: AirView2 (2.4GHz), AirView2-EXT (2.4GHz, external antenna), AirView9 (900MHz), AirView9-EXT (900MHz, external antenna). This graph is ideal for determining the best channel to setup a WiFi network for optimal performance. In the graph, each 2.4GHz WiFi channel is represented by a bar displaying a percentage representing the relative "crowdedness" of that specific channel. This percentage is calculated by analyzing both the popularity and the strength of RF energy in that channel since the start of a AirView session. An installer could use this view to optimize a network installation by avoiding highly used channels and setting up new AP's on channels showing the least usage. This graph displays a traditional Spectrum Analyzer in which energy (in dBm) is shown real-time as a function of frequency. There are three traces in this view: Max Hold, this trace will update and hold maximum power levels across the frequency since the start of an AirView session. Average, this trace shows the running average energy across frequency. Real-time, this trace shows the real-time energy seen by the AirView device as a function of frequency. Der Betrieb eines Signalverstärkers (z.B. Antenne) ist möglich und erlaubt, jedoch darf die max. Abstrahlleistung (EIRP) von 20dBm (100mW) nicht überschritten werden!